The title promises, open the article and welcome you this "Massive stars are responsible for producing the heavy elements that make up all life on Earth." You get, cramps in the stomach. 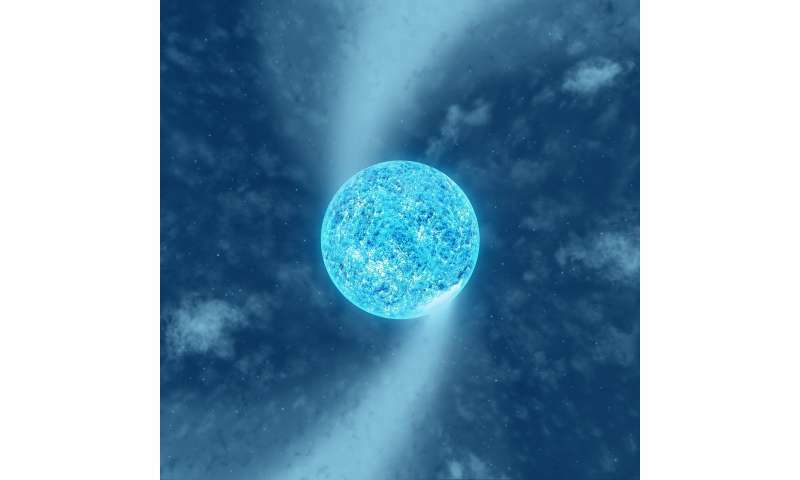 The chemical composition of the star is ~ 99% hydrogen and helium. Earth's mass is composed of mostly iron (32.1%), oxygen (30.1%), silicon (15.1%), magnesium (13.9%), sulfur (2.9%), nickel (1.8%), calcium aluminum (1.4%), with the remaining 1.2% consisting of trace amounts of other elements. Which cannons and guidance are used by authors, for Earth and which for gaseous planets etc. how far away is this star? 1,100 light years, more or less. Nice job by both the professional and amateur teams here. It's great to see amateurs making a real contribution to real research. It seems to fit predictions of my theory. It rotates 220 km/s which is pretty high rotational velocity. Due to rotation it attracts the surrounding material and is creating the S pattern. The bright places are point of the impact of the attracted material. And I would predict that the star has irregular shape - tri-axial ellipsoid which is causing it to have two places of impact. If it was regular ellipsoid the pattern would look more like spiral galaxy with several spiral arms and several places of impact. Do you have a basic grasp of chemical volatility?